Southeast Louisiana has received high marks for economic performance recently, but projected job growth lags other robust southern regions. And relative sea level rise is rapidly increasing flood risk. Working together, New Orleans, Baton Rouge, and Houma–Thibodaux can address these challenges by leveraging complementary industries to bolster legacy industries and diversify into emerging industries. At the heart of all three economies are sophisticated heavy construction, engineering and scientific consulting, and water transportation—expertise that can be leveraged for reducing flood risk here and around the world, thereby transforming our Southeast Louisiana economy. Southeast Louisiana has received high rankings for its economic performance during the Great Recession. There is a newfound energy and optimism post–Katrina that is a much needed change after decades of economic stagnation, meager job growth, and high poverty rates. However, the three metros of Baton Rouge, New Orleans, and Houma-Thibodaux are still largely dependent on legacy industries that are in decline, and the shift to a more diverse economy has been slow. 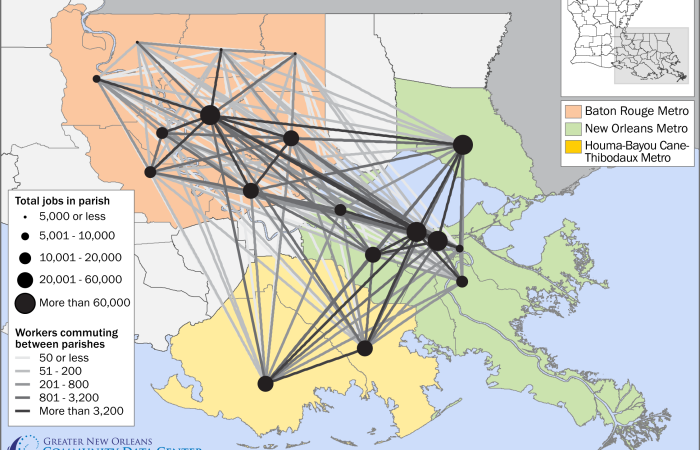 Subsequently, these three Southeast Louisiana metros are expected to grow jobs 1.4 percent annually through 2020—well behind regions such as Austin-San Antonio, Raleigh, Houston, and Atlanta that are benefiting from earlier efforts to diversify their economies and are projected to grow jobs by more than 2 percent annually. To compete with more vibrant Southern metros, Southeast Louisiana must diversify its economic base. At the same time, the region faces rapidly increasing flood risk to essential economic infrastructure and population centers. With post-Katrina rebuilding dollars coming to an end and an infusion of new dollars looming to support coastal restoration, the question arises: To what extent can New Orleans, Baton Rouge, and Houma-Thibodaux, working together, maximize their mutual economic sustainability? To a great extent, the answer lies within a rigorous analysis of industrial drivers, or specializations, within each region. Drilling down into the sub-sectors of shared industry specializations, we find that Baton Rouge, New Orleans, and Houma-Thibodaux are highly synergistic to each other in their economic roles. For example, the oil and gas industry served by Houma-Thibodaux’s Port Fourchon and the Louisiana Offshore Oil Port is the literal feedstock of the petrochemical manufacturing sectors in the Baton Rouge and New Orleans metros. The three regions also share complementary specializations in heavy construction and engineering, shipping, waste management, higher education, seafood processing, and certain advanced manufacturing sectors. Harnessing these economic synergies in Southeast Louisiana will be critical for bolstering growth in three emerging industries targeted by state and regional economic development organizations: the clean tech, digital media, and biosciences clusters. Many U.S. regions are competing for these same industries, and Southeast Louisiana faces significant challenges in developing the financing, talent, and research capacities that can grow these nascent industries in the long-term. At the heart of Southeast Louisiana’s economy are sophisticated heavy construction, engineering and scientific consulting, and water transportation. These services are omnipresent in three existing industries that economic development organizations aim to fortify: energy and chemicals, advanced manufacturing, and water management. The greatest challenge for these industries will be redeploying their assets to rebuild coastal marshes that protect economic infrastructure, including ports, pipelines, refineries, chemical plants, and ship yards. Wetland restoration activities will not only be synergistic to the region’s efforts toward economic transformation. They will also be key to the region’s overall sustainability.